Passover - or Pesach in Hebrew - is a Jewish holiday commemorating the Exodus of the ancient Hebrew people from Egypt where they were held in slavery under the Pharaoh. Celebrated for 7 days in Israel and 8 everywhere else, Passover is a spring holiday taking place between 14 and 21 Nissan in the Hebrew lunisolar calendar (in 2013 this will be March 25th to April 2nd). The main celebrations happen on the first night of Passover - the actual night of the Exodus - and on the seventh night, when it is said in the Scriptures that the miracle of Splitting of the Red Sea occurred, rendering them safe from Pharaoh's pursuit. In Israel, these two nights, along with preceding and following days, are state holidays, and the days in between are short working days. It is also time for spring break in schools and vacation time for many Israelis. The name of the holiday itself refers to the 10 plagues inflicted on the people of Egypt to persuade Pharaoh to let the people of Israel go. Because the Hebrew people followed Moses’ instructions, the plagues ‘passed over’ them. In their rush to leave the shores of the Nile and flee Pharaoh’s army, it is said that the people of Israel did not have time to leaven the bread. Hence Passover received its second name - The Holiday of Unleavened Bread. Consuming all leavened bread (chametz) during this holiday is strictly forbidden. Guidelines for Passover not only forbid all leavened foods in favor of mazzot (unleavened flatbbread), but they also require that all food products eaten during the holiday don’t contain a single crumb of fermented products. 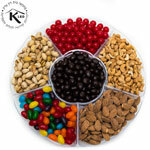 Thus, many product have to be "kosher for Pesach,: including chocolates, milk products, candy, and others, since during preparation these can touch leavening agents. 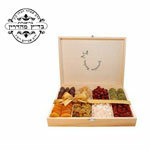 Limiting as it may sound, today’s cooks prepare delightful dishes with Mazzot that make delicious treats and wonderful Passover gifts. Israeli restaurants and Jewish venues abroad develop special treats for the holiday with delicious traditional and fusion Mazzot-based cuisine. They use bits of finely grated Mazzot and nuts to prepare cakes, cookies, and other items that would normally require flour and yeast. But of course, you don't have to limit yourself to just food items. 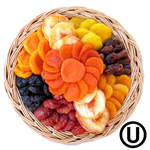 If you want to greet your friends and are not sure what to pick as kosher for Passover gifts, fruit and flowers are the safest way to go. They are always kosher, healthy, and a beautiful spring message. Another Passover custom requires that one’s, the house is also meant to be cleaned thoroughly before the holiday. All the cooking utensils and pottery undergo a purification ritual. 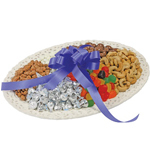 In fact, many families keep separate sets of dishes, cutlery, and cooking utensils just for Passover, so a pretty teacup or a new set of dishes make great Passover gift ideas as well. On the night before the holiday, a ritual search for leavened bread (bdikat chametz) is conducted to remove all traces. Curiously, if no crumbs are found during the search, it is considered ineffective. To ensure the ritual’s success, some crumbs (usually 10) are purposely left to be discovered and burned the next morning with other remains of leavened bread. Passover remains one of the three major Jewish holidays, when all family and friends gather around the table for a traditional Passover meal, or seder. Highly ritualized (even its name means order), Passover Seder retells the story of Exodus at the elaborate table. This traditional meal lasts around 4 hours and the rite incorporates many ways for entertaining young and old, from traditional songs to a customary search for afekoman (half a Mazza piece hidden during the meal). 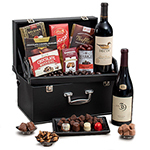 The one who finds it gets a special prize - so gifting kid-related items, such as kosher Passover candy or small toys will be appreciated in any family. Passover is family time - a holiday that welcomes new beginnings and celebrates freedom. It is the time of new blooms and exploration, of songs and discoveries. It’s a great time to spend with dearest loved ones, from far and near - or to send a greeting and feel closer, no matter the distance between you. 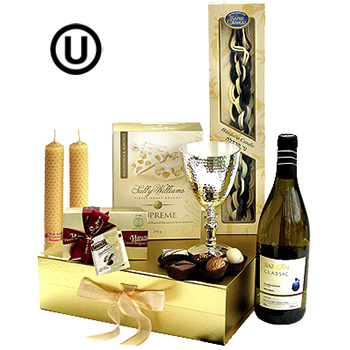 Passover is celebrated anywhere Jewish people observe the holiday, most commonly this includes Israel, the United States, France, Canada, Britain, and Russia; however, there are observant Jewish people on every populated continent around the world.